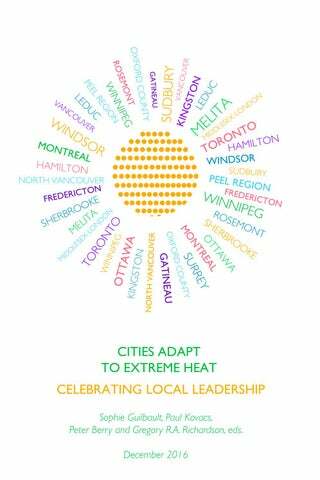 CITIES ADAPT TO EXTREME HEAT CELEBRATING LOCAL LEADERSHIP Sophie Guilbault, Paul Kovacs, Peter Berry and Gregory R.A. Richardson eds. CELEBRATING LOCAL LEADERSHIP By Paul Kovacs Canadians are experiencing more frequent and extreme heat events. Temperatures sometimes soar to levels that are dangerous to our health. The risk of health impacts from extreme heat is expected to continue rising due to climate change. Most deaths from extreme heat are preventable. Preparing for extreme heat events is a critical challenge for local governments and other stakeholders across Canada. The warming across the country since the 1970s has occurred two to three times faster than the average warming experienced in the rest of the world. Climate experts project that warming across Canada will continue for several decades, and perhaps much longer. On occasion, Canadians across the country are expected to experience summer temperatures unlike anything we have seen before. Indeed, record temperatures have been set in many communities in recent years. The frequency and severity of extreme heat events is projected to continue to increase with time, posing a threat to the health of vulnerable Canadians. The evidence over the past 20 or 30 years shows that the risk of death or serious health issues increases when the temperature rises. In particular, fatalities in many urban centres across Canada often start to increase when the temperature is above 25°C, and increase significantly when the temperature is above 35°C. Some communities have even experienced a few days when the temperature exceeded 40°C. Over the next 25 years, it is likely that many, and perhaps most Canadians will experience high temperatures dangerous to their health. The risk of heat illness and death is greatest for older adults, infants, young children, people with chronic illnesses, those who are physically disabled, people living alone, and those who work outside. The risk is greatest when temperatures increase beyond rates traditionally experienced, and when these high temperatures are sustained through several consecutive extraordinarily warm days and nights. Fortunately, efforts are underway to address the health risks of extreme heat in a number of communities across the country. Public health officials as well as city and regional governments are adapting to prepare for changes in the climate and developing strategies to protect people’s health during extreme heat events. Local and regional efforts to prepare for extreme heat is supported by provincial and federal governments, and by a number of other stakeholders taking action now to increase the resilience and safety of communities. Local and regional governments are in a position to implement many of the critical actions to help Canadians better cope with extreme heat. This includes issuing targeted warnings, opening cooling centres in public facilities such as libraries, community centres and public pools, providing water for those in need, educating the public, and planting trees and other actions to cool urban environments and reduce urban heat islands. Local, national, and global action to reduce greenhouse gas emissions is essential to reduce the pace of warming over the longer term â&#x20AC;&#x201C; the next 50 to 100 years and beyond. Over the next 25 to 50 years, however, it is essential that we also take action to prepare for the inevitable warming that will take place as a result of greenhouse gas emissions that have already been released. Greenhouse gas emission reductions and adaptation are both essential elements of a comprehensive climate change strategy. Heat Alert and Response Systems are developed to reduce the risk of illnesses and fatalities during extremely hot days. They include five core elements: community mobilization and engagement, an alert protocol, a community response plan, a communication plan, and an evaluation plan. The 10 case studies identified in this section were selected for being particularly strong in at least one of these five elements. THE SCIENCE During extreme heat events, those most vulnerable to health impacts (e.g. seniors, young children, and people with cardiovascular diseases or chronic illnesses) often require assistance to stay safe and healthy. Community response plans contained within Heat Alert and Response Systems include protective measures that can reduce health risks for various groups within the population, including the most vulnerable. Heat Alert and Response Systems are a collaborative effort that relies on the participation and outreach capability of stakeholders for both creating and carrying out response measures. Shared knowledge from all partners (e.g. public health officials, emergency management officials, social services providers, community groups) helps to inform response plans so that financial, staffing and volunteer resources are most effectively employed to reach vulnerable groups and reduce negative health impacts. Heat Alert and Response Systems have contributed to the reduction of illnesses and fatalities from heat events in Canadian and American communities since they were first implemented in the 1980s. Effective response plans employ measures tailored to stakeholder interests and capabilities. For example, publicly accessible, air-conditioned and climate-controlled cool rooms can be helpful in situations where individuals require cooling options, but do not have access to private air conditioning. THE TRIGGER Public health officials with Manitoba Health, Seniors and Active Living (MHSAL) and City of Winnipeg officials have recognized the growing risks to health associated with extreme heat events. The health consequences of severe heat waves in Europe and the United States, in which hundreds or thousands of people died, prompted health officials with the MHSAL Office of Disaster Management to increase preparedness of individuals in the City of Winnipeg and the province more broadly. MHSAL and the City of Winnipeg collaborated with Health Canada to conduct a Winnipeg-based heat-health vulnerability assessment, which evaluated the publicâ&#x20AC;&#x2122;s baseline exposure and sensitivity to heat, and the ability to adapt to extreme heat events. The assessment found that the general population in Winnipeg is vulnerable to extreme heat, with some groups at higher risk due to age, illness, socio-economic status and occupation. This assessment also identified opportunities to take actions to protect health while adapting to the changing climate. to heat events. The HSG developed a four-level heat alert protocol and has been working with stakeholders to develop appropriate response actions for each level. By engaging stakeholders from various backgrounds, the HARSAC gained access to a broad range of expertise. In Winnipeg, existing resources were identified that could be employed in response to extreme heat events (e.g. volunteer organizations and response activities already in place for other issues). Winnipeg used results from the heat-health vulnerability assessment to identify vulnerable groups that should be the focus of response measures. These measures were developed based on four factors: the nature of both the risk and vulnerability, capacity to engage the community, availability of resources, and the efficacy of the measures available. ODM and Public Health officials in MHSAL employ a continuous quality improvement approach to the Heat Alert and Response System, using HARSAC meetings and ongoing input from stakeholders, public health and disaster management officials. This helps to identify any needed changes to the system in order to improve preparedness for, and response to, extreme heat events. circumstances, the level of extreme heat forecast may also result in the Chief Provincial Public Health Officer issuing a bulletin in the form of a Heat Advisory, which is sent to media outlets through a news release. The Chief Provincial Public Health Officer may also share information using other communications services, such as websites and tweets. These bulletins notify people in Winnipeg of heat event, actions they should take to protect themselves, signs and symptoms of heat illness and where they can get more information. Targeted messaging may also be sent out to stakeholders, such as health care professionals, public sector workers, and social services providers. Heat-related communication materials may also be supplied to organizers of outdoor community events while heat alerts are in effect. Community partners such as the Red Cross and Salvation Army are active in heat response efforts, engaging their own networks and reaching out to at-risk populations as the situation warrants. The City of Winnipeg’s Emergency Preparedness and Coordination Committee works to identify and meet the emerging needs of citizens during extreme heat. The city may, for example, extend pool hours or extend the hours of air-conditioned City of Winnipeg facilities for people to access. City of Winnipeg departments, such as Community Services, Water and Waste, Public Works, the Police Service, Transit and Corporate Communications have a list of activities and tasks that may be implemented during heat events. Public Works, for example, may arrange for additional seating and water supply for people entering cooling areas to escape the heat. Figure 7 shows the location of public use facilities in Winnipeg, a number of which may help provide respite from extreme heat. MHSAL and stakeholders work together where possible to identify and collect data on heat-related health impacts (e.g., Emergency Medical Services calls during heat events, calls to telehealth phone lines). Service providers also review usage of resources, such as cooling locations and bottled water, to help inform and improve response plans for future events. Collected data and a post-season review of heat events is discussed with members of the HARSAC at the end of each heat season and continues to aid in refinement of adaptation strategies to meet the diverse needs of Winnipeg residents during extreme heat. A WORD FROM WINNIPEG When asked what advice he would give to other municipalities that would like to implement a similar program, Randy Hull, Emergency Preparedness Coordinator for the City of Winnipeg, indicated that the biggest internal challenge is to determine what services can be alerted or extended to provide comfort and relief to citizens. “Although a heat alert is primarily a health event, the City of Winnipeg’s role in mitigating heat-related events is vital to public well-being. While the City of Winnipeg Heat Plan is limited to actions at the local level, support is provided from the MHSAL’s Office of Disaster Management and other sources. This helps to transmit reliable information that guides the City of Winnipeg’s response,” said Mr. Hull. THE SCIENCE Effective communication of heat alerts and measures to reduce health risks is a fundamental requirement for a successful Heat Alert and Response System. Heat-health communication campaigns aim to increase knowledge of the dangers from extreme heat and to influence individuals to adopt protective behaviours. Targeted communication needs to be delivered before and during the heat season, and especially during extreme heat events. To increase the effectiveness of heat-health communication campaigns, collaboration is needed among different communities and stakeholders, as well as public health, emergency management, and municipal officials in order to deliver consistent, audience-appropriate and easily understood messages. Many people are unaware of the risks that extreme heat poses and are dependent on other people for support that would reduce their health risks from extreme heat events. Landlords and caregivers are often in a good position to be first responders and provide needed assistance. They can also play a central role in building awareness with their tenants about heat-health risks and the importance of staying cool and hydrated during an extreme heat event to protect health. THE TRIGGER A number of at-risk groups (older adults, people with chronic illnesses, the physically impaired, the socially disadvantaged, and newcomers to Canada) live in apartment buildings and residential care facilities with no air conditioning. Residential care facilities provide care for individuals who need assistance with managing their lives. In an effort to address the possible impacts that extreme heat could have on residents in these buildings, the City of Hamilton identified the need to build awareness among landlords and operators of residential care facilities about extreme heat impacts on health and to provide information about feasible actions that they could take to protect vulnerable populations. •	Provide residents access to a cooler area in the building during a heat event for several hours at a time (e.g. a common room with air conditioning or a basement area); •	Keep windows in hallways slightly open to allow air to circulate; •	Provide heat safety information to residents or post the information in common areas (e.g. by the elevator, in the lobby); •	Have building staff check on vulnerable residents every few hours during extreme heat events. The communication materials are reviewed annually. The content and marketing strategies are updated when necessary. •	Have access to key information that can be used to foster heat-resilience among these populations; •	Are more aware of possible actions that they could take to assist their residents to manage heat risks; •	Can recognize signs and symptoms of heat-related illnesses; •	Know what first aid to administer as well as when to call 9-1-1. The impacts of these outreach efforts are increasingly evident as many landlords are taking actions to set up cool spaces, check in on vulnerable residents, and work collaboratively to provide needed respite from the heat for their residents. For example, two landlords that own adjacent buildings worked together to develop a common area in one of the buildings to provide a cool space where residents of both buildings can comfortably escape the heat. Working with landlords can be a cost-effective mechanism to reduce heat-vulnerability in the community and build awareness about the issue. THE SCIENCE Longer and more severe extreme heat events will impact the health of Canadians unless more adaptation efforts are made. It is important that health authorities across the country establish alert protocols to prepare for these events as there is a correlation between elevated temperatures, increases in mortality, and the incidence of disease. This correlation is region-specific and can vary depending on the duration and severity of the event. Other factors such as a population’s vulnerability and its capacity to adapt to extreme heat can influence how a population will react under high temperatures. Implementing region or community specific triggers contributes to better response to the specific needs of a community during extreme heat events. Heat-alert triggers should take into account how changes in intensity and duration of an extreme heat event can impact mortality and morbidity within a specific community. Triggers are usually community-specific measures derived from one or more meteorological parameters (e.g. temperature, humidity) that are forecasted to last for one or more days. THE TRIGGER Gatineau implemented a plan to address and mitigate health risks in response to the increased likelihood of severe extreme heat events in Canada. The plan was based on lessons learned from Montreal and guidance from the Province of Quebec. It was developed through a partnership between the Province of Quebec and the southern region’s Health Agencies, which identified region-specific thresholds when higher mortality and morbidity rates were observed. The Health Agencies then used these thresholds to set local triggers for the regions of Quebec most likely to be affected by a heat wave. THE APPROACH The temperature and humidity thresholds associated with different levels of heat alert are slightly different from one location to another as flexibility is given to regional authorities to adapt their thresholds to the circumstances of their local context. The thresholds adopted in Gatineau were determined by Santé Publique du Québec. To ensure timely and accurate identification of local weather patterns that reach set triggers, seasonal surveillance is in effect from May 1 to September 30. During this period, local authorities (with Santé Publique du Québec as the lead) work closely with Environment and Climate Change Canada. This partnership allows access to timely weather forecasts that are critical to supporting decisions to issue an Alert and initiating response measures. In addition, in an effort to provide inter-jurisdictional consistency, Santé Publique du Québec worked with Ottawa Public Health and other municipalities in the region to ensure timely and consistent communication with the public and partners. When an Extreme Heat Warning is issued by Environment and Climate Change Canada or temperatures are forecast to reach ≥30°C and humidex ≥40, Active Surveillance is activated and the team is put on standby. During this stage, the Emergency Operation Centre members are informed of the change in status and must be ready to mobilize at a moment’s notice. If extreme temperatures and humidity are forecast to be sustained for at least two consecutive days - with maximum temperatures of ≥31°C, humidex ≥40, and minimum temperatures of ≥ 18°C - an Alert is issued and response measures are implemented on the third day to assist the public, particularly for populations at risk. For example, Public Health Gatineau disseminates heat-health information to the public and at-risk groups in locations such as day cares and seniors’ homes. The Intervention phase of the protocol is activated when alert indicators are proven, when the watch data shows increased transportation and admission to local hospitals or when excess deaths are observed. When the temperature no longer represents a risk to peoples’ health, a Recovery phase is activated and lessons learned are used to improve the system (figure 4). THE OUTCOME The collaboration between Santé publique du Québec, the southern region’s Health Agencies and the City of Gatineau led to the identification of triggers that are locally focused, based on heat-health relationships, and harmonized across the province and inter-jurisdictionally. The alert protocol now takes into consideration factors such as the duration of the heat event, maximum and minimum temperatures and humidex. The protocol is implemented in multiple stages which are linked to specific response measures. When an alert is issued, Gatineau works in partnership with the Centre intégré de santé et de services sociaux and the Direction de santé publique to provide services to at-risk groups, issues alerts, and delivers relevant health-protection information to people who are at an elevated risk (e.g. older adults). Communicating heat-protection information helps to improve awareness about the risks and builds knowledge of actions that should be taken to protect health. THE SCIENCE Every year, cities across Canada host numerous events where large numbers of people are gathered in one place. These events can take many forms, from music festivals to sporting events. Regardless of the type of event, mass gatherings have the potential to overwhelm local health care systems and research shows that heat- and cold-related health conditions provide the highest number of patient presentations to hospitals during and following mass gathering events. When mass-gathering events take place in the summer time, they necessitate careful planning by the event organizers to reduce heat-health risks among attendees. Indeed, conditions such as dehydration and heat stroke can quickly develop during extremely hot days. Event planners can implement a variety of preventative actions such as the provision of on-site medical care, the promotion of information to avoid heat-related illnesses, the availability of cooling stations and adequate access to water stations. THE TRIGGER The City of Leduc was selected to host the Alberta Summer Games in July 2016. This would see the city play host to approximately 10,000 people over four days of competition. While extreme heat events are considered to only be a moderate risk in Leduc because of a typically moderate climate, the city still included specific planning actions to mitigate potential heat-health risk when preparing for the Games. These actions were integrated into a broader emergency preparedness strategy that planned for other weather extremes such as thunderstorm and tornado risk. Planning to mitigate heat-health risk for the Alberta Summer Games was also aligned with Leducâ&#x20AC;&#x2122;s Weather and Climate Readiness Plan, which highlights the importance of being prepared for the risks associated with extreme weather events. THE APPROACH Specific actions were taken by the planners of the Alberta Summer Games in Leduc to ensure that both athletes and their supporters would be protected from a broad range of extreme weather events, including heat waves. More specifically, volunteers at the Games were trained to recognize symptoms of several health issues, including heat-related conditions such as dehydration and heat stroke. When noticing these symptoms, volunteers were trained to call on-site health care professionals through an emergency line and direct them to the individuals requiring medical attention. Planning efforts before the Games also focused on hydration. Water stations were located across the site to make sure all attendees could easily access it when needed. These water stations allowed attendees to refill existing water bottles or get new reusable ones. One of the objectives pursued by the planning committee of the Games was to host a disposable water bottle-free event. As such, the organizing committee asked vendors not to sell water but instead to give out free reusable bottles. With careful planning, Leduc was able to meet this sustainability goal without sacrificing the health and wellness of the athletes and other attendees. Golf carts were also used to transport five-gallon bottles of water to ensure all stations had enough water at all times. These golf carts were also used to support medical staff in emergencies by delivering ice and various supplies and to move low-risk patients to a medical area at the Recreation Centre. During sporting events like the Alberta Summer Games, athletes are particularly at risk of suffering from dehydration on hot days. In order to minimize this risk, a few water stations were planned and installed specifically for athletes to ensure they could easily access water at all times. Information on the importance of hydration was also disseminated to athletes prior to the event through the Games handbook. Finally, people attending the Games always had easy access to the recreation centre building to cool off during the event. This is particularly important as spending a few hours per day in air conditioned spaces during extremely hot days can significantly reduce the risk of heat-related health conditions and heat stress. Cooling shelters allow the body to cool off when it is is unable to do so outdoors. twice during the Games to protect people from severe thunderstorms. The recreation centre, which was also the planned cooling station for the Games, was then used as a temporary shelter to protect attendees from the storm. A WORD FROM LEDUC Even though Leduc only faces a moderate risk of being affected by extreme heat events, the city still included extreme heat planning within its broader emergency preparedness strategy for the 2016 Alberta Summer Games. When asked what advice she would give to other municipalities that would like to mitigate heat-health risks when planning mass gathering events, Pamela Goertzen, Environmental Sustainability Assistant for the City of Leduc, noted that there are numerous benefits to having the venues in relatively close proximity to each other, particularly when they are close to a large indoor air-conditioned facility that can shelter all attendees in the event of an emergency. â&#x20AC;&#x153;Having sufficient hydration is also very important and can be done without creating the mountain of waste that comes with bottled water,â&#x20AC;? said Ms. Goertzen. After the Alberta Summer Games, Leduc was left with two of the water units used for the Games. One of the units will be used for future events and the other will be used during future emergencies where people may not have access to water in their homes. THE SCIENCE Extreme heat events can affect the health of all Canadians, but certain populations are at higher risk. People who are more vulnerable include: older adults, infants and young children, people with chronic illnesses or who are physically impaired, socially disadvantaged individuals, transient populations, certain occupational groups, and the physically active. Although the homeless population is not usually discussed as a separate group in the literature, a number of risk factors that increase susceptibility to heat-related illness and death are found to be more common in individuals who are homeless. Such factors include cognitive impairment, higher rates of chronic diseases, and non-adherence to therapy to reduce illness, for example for conditions such as diabetes, high cholesterol, and hypertension. Due to increased exposure, people who live in shelters and out of doors are at higher risk of suffering from heat-health conditions during extreme heat events. They often reside in inner urban areas which tend to be subject to hotter conditions due to the urban heat island effect. Many of these people have limited access to air conditioning, transportation to local shelters, and options for hydration. To be effective in reducing risks, public health interventions must address the specific constraints and barriers faced by each population group when devising strategies to protect health. For example, while directing seniors or people with low incomes in high-rise buildings to community cooling centres to get respite from the heat may seem a reasonable solution, it may not reduce risks to seniors with limited or no mobility. Further, it does not address the challenges faced by people with little money in their efforts to get to the centres. THE TRIGGER Many communities across Canada are expected to experience an increase in the length, frequency, and/or intensity of warm spells or extreme heat events. In Vancouver, the average annual temperature is expected to increase by 1.7°C by the 2050s and 2.7°C by the 2080s. Similarly, by the 2050s an extreme heat event that occurred once every 25 years in the past is expected to occur over three times as frequently (City of Vancouver Climate Adaptation Strategy, 2012). Extreme heat currently poses significant risks to health for some populations in British Columbia. In 2009, an extreme heat event in the lower mainland area of the province contributed to 156 deaths. One study suggests that heat-related mortality in Vancouver is predicted to increase to 1.72/100,000 (an increase of 325%) from the baseline of 0.53/100,000 for the period between 2013 and 2050.
make recommendations on the services that would further reduce the risk for street homeless and other vulnerable populations, such as homebound senior citizens, in the event of extreme heat events.” This led to the development of the city’s Extreme Heat Initial Response Guideline. The Initial Response Guideline highlights functions that the city’s business units and key external partners agree to undertake in response to extreme heat event emergencies. This plan was developed by staff from various city departments and was led initially by the Community Services Department. The city’s Office of Emergency Management, a key participant from the start, took over in Phase II of the planning process, continuing management of extreme heat responses. Other key external partners supporting the city’s extreme heat response are the Environment and Climate Change Canada’s Regional Warning Preparedness Meteorologist, the Metro Vancouver Air Quality Division and Vancouver Coastal Health (the latter also supported the development of the city’s plan). response priorities, working with partners such as Vancouver Coastal Health and experts from Health Canada, who provided support and shared experiences about best practices on heat mitigation. Four types of response activities, all focusing on vulnerable populations, were identified by the Committee (see Figure 6). Increasing access to drinking water includes actions such as the pre-positioning of water fountains prior to the beginning of summer, deploying additional portable fountains based on risk assessment outcomes and advising staff at Park Board facilities to open up kitchens so that clients can fill water bottles. Opening cooling centres implies actions like posting “Cooling Centre” signage and posters at community centres and libraries when Special Weather Statements or Heat Warnings have been issued or are impending and extending hours of operation for cooling centres based on risk assessments. Monitoring of outdoor spaces for at-risk populations involves actions such as driving by parks and commercial areas to advise vulnerable populations about the location of nearby water fountains and increasing park patrols by Park Rangers to locate and assist people suffering from heat-related illness. Finally, public outreach and information relates to activities like advising the public of heat alerts and warnings by using various tools (such as media releases, social media, 3-1-1 contact centre, etc.) to inform them of available resources to reduce the health effects of heat and encouraging residents to look out for each other and obtain assistance for people exhibiting signs of heat related illness. A WORD FROM VANCOUVER When asked what kind of advice she would give to other communities that would like to develop a similar tool, Hersi Hibak, Emergency Planning Coordinator for the City of Vancouver, indicated that “the City’s Climate Adaptation Strategy (2012) recommends that a study be done to map heat islands and vulnerable populations in the city. This information will help identify areas that are most at risk and will allow the City of Vancouver to focus its mitigation efforts (e.g. planting trees and locating drinking fountains) in areas where they are most needed.” The city is looking at creating extreme heat-related map layers to be accessible from its web-based Geographic Information System (VanMap) as an important resource for the Extreme Heat Planning Committee during extreme heat response operations. The Committee will continue to implement actions identified in the Climate Change Adaptation Strategy, such as developing cooling centres within identified hot spots, and exploring options for transporting those in need to these cooling centres during heat events. THE SCIENCE During extreme weather events, the success of a communityâ&#x20AC;&#x2122;s response depends highly on the ability to exchange information and coordinate response activities between emergency responders and residents. When an extreme heat event happens, the coordination between health authorities, medical services and various community groups is instrumental to the success of operations. Similarly, social networks and relationships among residents have proven to be extremely useful to ensure everyone is looked after within a community during heat waves. Regional health units in Canada tend to cover broad geographical areas, which can be challenging when the time comes to respond to an extreme heat event. Creating and maintaining good relationships with various community partners such as day cares, school boards, and community health clinics can significantly facilitate the work of the health unit. THE TRIGGER In June 2005, the City of Toronto experienced an extremely warm summer with 18 days of extreme heat alerts. Following this particularly hot summer, the Government of Ontario requested that regional health units and municipalities across the province work towards establishing response plans for extremely hot days. This request led to the development of the Middlesex-London Health Unit (MLHU) Extreme Temperature Alert Protocol. Since its initial development, the plan has been reviewed and edited on multiple occasions following its activation during extreme heat events. The MLHU has also expanded its network of partners through the county in order to better respond to heat waves. transformed into cooling centres. During extreme heat events, the city can count on the support of many groups such as the Salvation Army/Menâ&#x20AC;&#x2122;s Mission to increase shelter capacities for homeless people and other vulnerable groups. In smaller rural parts of the county, the MLHU relies on the assistance of its community partners to ensure heat warnings are properly communicated. For instance, it works closely with local day cares, seniors facilities, schools, local churches, various religious groups, and community health clinics that act as a point of relay for the information coming from the MLHU. These groups also play an important role in communicating with the individual residents and making sure they are taken care of. of protecting family, friends and neighbours. The MLHU is currently reviewing how it could make some of their partnerships with local groups more formal to ensure an even stronger communication with rural areas during heat alerts. The MLHU is also currently working on the development of a survey that will be shared with every partner involved in responding during heat waves to gather their impressions and comments on the operations following an extreme heat event. A WORD FROM MIDDLESEX-LONDON When asked for their thoughts on the MLHU Extreme Temperature Alert Protocol’s success, David Pavletic, Manager of Food Safety & Healthy Environments and Randy Walker, Public Health Inspector for the MLHU, mentioned that its success was directly linked to the strong sense of collaboration and community present in Middlesex County and within MLHU. “We were able to leverage several of our relationships to make this plan successful by engaging many community groups,” said Mr. Walker. THE SCIENCE Stakeholder engagement is a key element in the development and implementation of a community-based Heat Alert and Response System. A Heat Alert and Response System is most effective when public health organizations, municipal authorities, emergency preparedness officials, social services agencies and community outreach groups are actively engaged and working together to promote community-wide resiliency. Establishing and maintaining good relationships with all interested partners is needed from the earliest stages of project development. Stronger relationships with partners over time will ensure that stakeholders play an important role as advocates and will ease conflict resolutions if any problems were to arise down the line. Maintaining stakeholder interest and contributions during the development of a Heat Alert and Response System can be challenging and resource intensive. However, regular interaction and face-to-face meetings with stakeholders can create an environment where their participatory involvement in the decision-making process ensures buy-in to the process and effective use of scarce resources. THE TRIGGER The City of Fredericton (population 56,224) is situated in the west-central portion of New Brunswick. This region has historically experienced a higher number of hot days than elsewhere in the Maritimes. Climate projections indicate that Fredericton can expect the number of hot days to almost double by mid-century, coupled with an increase in warmer nights. In spite of these projections, extreme heat as a public health risk remains an emerging issue for Fredericton and communities throughout Atlantic Canada. Beginning in 2009, Health Canada partnered with the New Brunswick Department of Health to pilot a multi-year initiative to develop a community-based Heat Alert and Response System. As part of this initiative, Health Canada conducted a temperature-mortality analysis for the City of Fredericton, which found a sharp increase in mortality when the daily maximum temperature exceeded 30oC. Without further adaptation, heat-related health risks within this region may increase with a changing climate. non-government organizations. The role of this multi-stakeholder advisory committee is to increase the support from various agencies and organizations for at-risk populations and to identify best practices to communicate and share information between agencies at the onset of an extreme heat event. New Brunswick Health’s approach to building a Heat Alert and Response System through stakeholder engagement was two-fold. First, the structure of the advisory committee consists of a small core of stakeholders with extensive networking capacities. The membership is drawn from respected organizations within the community that serve as credible sources of information. Second, the committee has built on existing alert and response structures, thus reducing the challenges associated with building a new system. New Brunswick Health’s proactive engagement with stakeholders has enabled all partners to draw on their experience in responding to other types of emergencies and to apply those lessons to the development of a Heat Alert and Response System. THE OUTCOME Prior to the Heat Alert and Response System pilot, only a press release from New Brunswick Health, derived from Environment Canada weather warnings, was used to inform the public of an extreme heat event. This notification system was based on a tiered range of Humidex values and used the terms ‘advisory’, ‘warning’, and ‘alert’ to describe the three levels of severity. During the Heat Alert and Response System development phase, New Brunswick Health was able to make refinements to the triggers based on key input from stakeholders. This resulted in a new wording reflecting the increasing intensity of risk that clarified and simplified the level of alert in both English and French. Thus, the triggers were modified from using the varying series of adjectives to a plain-language tier of ‘Heat Alert’, ‘High Heat Alert” and ’Extreme Heat Alert‘. The Heat Alert and Response System also adopted a simple corresponding numbering system of level 1, 2 and 3 (see Figure 10). To support the roll-out of the City of Fredericton Heat Alert and Response System, two bilingual websites were launched that were specifically designed and built for the heat season. Stakeholders supplemented the awareness campaign by providing one-on-one training to their clients about heat-health risks and by distributing materials to at-risk populations. The city also included a heat-health information brochure in its spring municipal water utility bills. The feedback received during and after the first heat season indicated that the numbering system (Level 1, 2 and 3) had been easily adopted and used by Heat Alert and Response stakeholders, the media, and the public. A WORD FROM FREDERICTON When asked what kind of advice she would give to other communities considering a similar approach to the development or improvement of a Heat Alert and Response System, Karen White, Director of Healthy Environments Branch, said that “six years later, the Heat Alert and Response System program in Fredericton is doing well. The pilot program was successful because it started out small and leveraged the already established excellent network of community based non-government organizations thus avoiding the need to ‘reinvent the wheel’. It drew from existing structures and the experience and expertise of staff in departments at both the municipal and provincial level. Health Canada provided a wealth of materials and evidence-based information that were an immense help in moving the project in the right direction.” Although the Heat Alert and Response System pilot was a Fredericton specific project, the Office of the Chief Medical Officer of Health has used its coordinating role to disseminate education and promotional messages to all health regions in New Brunswick. By working first at the local level and delivering a proven product, the Office of the Chief Medical Officer of Health is exploring avenues to expand the Heat Alert and Response System concept to the rest of the province. THE SCIENCE Ensuring the availability and accessibility of cooling options to cope with hot temperatures is very important during extreme heat events. Bearing in mind that not all members of a community have access to cooling systems in their homes, it is important that municipal leaders identify easy-to-access cooling stations that can be used by the public during heat waves. These cooling options can take multiple forms and cities can benefit from identifying a wide range of alternatives for residents to get away from the heat. For instance, public buildings with air-conditioned systems, public pools, beaches, and splash pads can be considered as possible cooling options by municipalities. THE TRIGGER Sherbrooke is a city located in the Eastern Townships region of Quebec. A study conducted in the region a few years ago found that health risks were increasing significantly for inhabitants of the region when the temperature reaches or exceeds 31°C during the day and 18°C at night for at least two days in a row. Following the publication of this study, the City of Sherbrooke implemented two main actions. First, the city developed urban heat island mapping to identify which areas of the city were the most at risk of being affected by extremely hot temperatures. Second, Sherbrooke established a Heat Alert and Response System to help protect the public during heat waves. temporary lighting equipment for splash pads and pools that need it in order to stay open later in the evening. La mission eau potable is responsible for conducting additional water quality testing at public pools on extremely hot days and increased security is provided around specific parks and swimming pools. An organization called mission communication provides information on the location of cooling stations through press releases, the city’s website, and social media. In addition, the city’s municipal health network communicates with seniors’ homes that do not have active cooling systems to inform them of the cooling station locations and transit options to get there. When the City of Sherbrooke developed its emergency plan, staff visited each of the city’s parks and noted if they were equipped with water fountains, washrooms, showers, benches, tables, covered or shaded areas, splash pads, pools, beaches, and air-conditioned spaces. As part of its heat response, the city’s communication group promotes the use of these cool spaces during extremely hot days. city’s libraries in combination with extended hours at local pools, beaches, and splash pads for three consecutive days. Local public transit authorities also assisted with the transportation of vulnerable individuals to cooling centres. A WORD FROM SHERBROOKE When asked for his thoughts on the City of Sherbrooke’s Extreme Heat Intervention Plan, Stéphane Simoneau, Director of Fire Services at the City of Sherbrooke, responded that the city was able to develop and implement a high-quality plan because of good cooperation between the regional health authority, Sherbrooke public safety and the municipality. “It is important to have constant communication and collaboration between these different entities to ensure successful activation of the plan during extreme heat events,” said Mr. Simoneau. THE SCIENCE To be effective, Heat Alert and Response Systems need to be evaluated with the participation of a broad range of community partners. Evaluations can be formal or informal and can examine Heat Alert and Response System processes and/or outcomes. Process evaluations analyze the performance of key alert, response and communications mechanisms and activities (e.g. sending of alerts, outreach to key service providers of vulnerable populations, and the dissemination of heat-health messages that underpin the Heat Alert and Response System in a community). Outcome evaluations gauge whether the Heat Alert Response System has actually resulted in a reduction in morbidity and/or mortality over time. Heat-health vulnerability in Canadian communities changes with time and place. People may become acclimatized to increased temperatures, access to air conditioning may change, there may be changes to the urban environment (e.g. greening) that alter levels of exposure, and demographic shifts may increase or decrease the numbers of people at higher risk of heat illness and death. In addition, urban environments are often hotter than rural environments due to the urban heat island effect. Consequently, Heat Alert and Response System evaluations should be conducted regularly to consider changes in these or other factors that might necessitate changes to the system. A number of communities in Canada hold pre- and post-heat season meetings with stakeholders to evaluate their Heat Alert Response System and plan for future extreme heat events. During these meetings, information is exchanged on new vulnerable populations, changes to communications approaches and technology, challenges in delivering key Heat Alert and Response System activities, and opportunities for making the system more effective. THE TRIGGER In 2002, the City of Ottawa established an Extreme Weather Committee to increase public awareness of the health implications of extreme heat and cold, establish baseline data on health outcomes related to heat, cold and air pollution for the region, and evaluate existing activities and policies in order to plan for the future. The Hot Weather Response Plan in Ottawa originated with a Heat and Smog Action Plan in 2004. Growing evidence that people living in the city were at increasing risk from heat and smog, and that heat mitigation plans being implemented in other Canadian and U.S. jurisdictions where successfully protecting health motivated city officials to develop a Heat Alert and Response System. The Hot Weather Response Plan includes weather, ultraviolet radiation, and air quality monitoring, a communications strategy with a major roll-out with the first extreme heat event, coordination of the community response with community providers through an Outreach to Vulnerable People Strategy and ongoing research and policy development related to the system. urban heat islands in the city and the location of its most vulnerable populations, conducting a hot weather vulnerability assessment workshop with key service providers, evaluating the effectiveness of key components of the Response Plan and planning a mock heat emergency exercise. In addition, internal and external partners meet twice annually to discuss and improve the extreme weather response provided to city residents. In November 2013, Ottawa Public Health hosted a Heat and Health Vulnerability Assessment Workshop with the objectives of (1) Discussing and providing information on how Canadian communities are vulnerable to the health impacts from extreme heat events and what might be needed to improve adaptive capacity to impacts from heat in the City of Ottawa; (2) Identifying vulnerable populations and discussing opportunities for collaboration among stakeholders, service providers and volunteers to reduce the health risks associated with an extreme heat event; and, (3) Introducing available information and tools for addressing these risks. Participants at the workshop included officials from groups such as Emergency Preparedness, Social and Housing services, municipal childcare centres, the Salvation Army, the Ottawa Farm Safety Association, and pharmacy professionals. Participants completed a pre-workshop survey and received a workshop handbook before the meeting. Facilitated discussions examined the people currently identified as being vulnerable to extreme heat in Ottawa, including the subgroups that are most at risk and the characteristics that make each group vulnerable to heat. THE OUTCOME The key findings of the Heat and Health Vulnerablity Assessment Workshop revealed that: 1) There are strong networks in place in Ottawa that assist identified vulnerable populations (i.e. church and social groups for older adults, new parents as well as day care and child drop-in centre professionals for young children, and street outreach and emergency shelter staff for the homeless). These networks are part of extreme weather outreach activities and are efficient and effective at reaching vulnerable groups. 2) Service providers develop effective strategies to deal with extreme heat events as a result of phone calls with their clients. This feedback has resulted in important changes to policies and procedures to build organizational capacity. 3) Rooming house residents and isolated seniors remain at risk during extreme heat events due to social isolation and lack of air conditioning. There is a need for fans and air conditioning for low-income renters. 4) Young outdoor workers may need more awareness of heat risk factors so they come to work adequately hydrated and protected from the sun and heat. 5) Policies, procedures and resources need to be in place and shared within an organization well in advance of hot weather events. The summer is prime vacation time and back-up and replacement staff need to know what to do and feel confident in adapting programming if they are to be effective. Based on workshop findings, the City of Ottawa Interagency Extreme Weather Committee has been working to address these findings by reaching out to service providers of newly identified at-risk populations. It also followed up with a tabletop exercise (sessions where different stakeholders meet to discuss and define their roles during an emergency response) in 2015 with five pre-existing service provider networks and is updating the Hot Weather Response Plan. Finally, the Committee is offering to assist community agencies with developing and updating extreme weather policies. A WORD FROM OTTAWA â&#x20AC;&#x153;Every extreme weather event provides the City and our community partners a chance to learn and improve. We have gained a deeper understanding of community needs and capacity through face-to-face encounters with service providers at events such as the Vulnerability Assessment Workshop and tabletop exercises. Start small if needed, but get people together if you really want to find out how to build and harness community capacity. Face-to-face meeting are key to building trust and meaningful relationships,â&#x20AC;? said Martha Robinson, Extreme Weather Lead for Ottawa Public Health. THE SCIENCE Extreme heat events can significantly affect the health of a population. Mitigating the adverse effects of these events requires a strong level of preparedness. This can be achieved through close collaboration between public health and emergency management officials, local authorities, social service providers and individuals. Such collaboration is crucial to developing a heat response plan and to properly communicating heat risks to more vulnerable groups that can be difficult to reach through the use of traditional media. Within a population, groups such as older adults, the chronically ill, and infants and young children are particularly vulnerable to extreme heat events. Maintaining relationships with stakeholders that work closely with these groups is essential to a good risk communication strategy and to the implementation of a successful heat response plan. cards and to prioritizing three main messages: seek out air-conditioned spaces, drink a lot of water, and reduce physical activity levels. In addition, Montreal Public Health Department made two additional recommendations: ‘Let someone know how you are on a regular basis’ and ‘Take cool showers or baths as often as needed or cool off using a damp facecloth.”’These last recommendations were perceived as being particularly helpful for individuals with mobility issues who might find it challenging to get to air-conditioned spaces. might have not been fully aware of the increased risk this population faces during extreme heat events. Following the July 2010 heat wave, it was decided that a specific communication campaign targeted at individuals living with mental illnesses would be implemented during heat waves. The evaluation of the 2010 heat plan activation also led the public health department to plan for additional preparedness work in collaboration with local health and social services centres, community organizations, and psychiatric hospitals. This decision was made to ensure that vulnerable groups are closely monitored during future extreme heat events. A WORD FROM MONTREAL When asked what advice he would give to other cities that would like to implement a similar heat response plan, Norman King, coordinator of the urban environment and health sector of the Montreal Public Health Department, highlighted the importance of developing partnerships with various stakeholders as early as possible in the process. “You can’t do it alone. Collaborating with the different municipal departments, regional stakeholders and neighbouring municipalities is essential to this process,” said Mr. King. He also recommended “re-evaluating and adapting a heat response plan on multiple occasions over time as public health and municipal authorities can adapt their approach according to the results of research and previous activation experiences.” According to Mr. King, it is also important to view public health departments as leaders in the heat response process. While several stakeholders need to be involved to implement a successful plan, it appears that most partners and local authorities tend to expect a clear and structured response from public health authorities. Finally, the department of public health highlighted the importance of knowing a city’s demographic and territorial characteristics when implementing a heat response plan. “Being able to respond properly to extreme heat events is extremely important but that should be done in parallel with other activities. For instance, if certain neighbourhoods have a long-term greening plan, or a plan to increase air-conditioned spaces, the impacts of extreme heat events could be mitigated over time,” said Mr. King. Preventative Actions are actions that can be taken by communities to mitigate the impacts of extreme heat events in the long term. The benefits of these actions are optimal when implemented in parallel with Heat Alert and Response Systems. THE SCIENCE Extreme heat events are expected to become more frequent and severe because of climate change. The consequences associated with these events tend to be exacerbated by a phenomenon called the urban heat island (UHI) effect. The UHI effect happens when an urban area becomes warmer than its rural surroundings. As cities develop, the landscape is often transformed from vegetated surfaces to higher ratios of buidings and paved surfaces, resulting in greater heat retention. These changes tend to increase the temperature of urban areas significantly and create an ‘‘island’’ of higher air temperatures estimated to be 1°C to 3°C warmer than surrounding areas. In the evening, the difference between urban and rural temperatures can be as high as 12°C, as the UHI effect also results in reduced night-time cooling. There are various ways communities can mitigate the impact of the UHI effect. For instance, they might choose to use cool surface materials, such as reflective roofs or cool pavement, which help reflect solar energy away from buildings or paved surfaces. Another approach that can be taken is to increase tree and vegetative cover. Vegetated spaces can increase the comfort of pedestrians by providing shade and can contribute to reducing high summer temperatures through evapotranspiration. THE TRIGGER Official community plans contain guiding principles that define and orient the development of municipalities. These plans represent the foundation of the planning process and are essential tools for managing future urban growth. In 2010, the City of Kingston chose to use its official plan as a tool to improve the urban forest and green spaces within the city. While the city’s decision to invest in the maintenance of an abundant tree cover in urban areas was influenced primarily by the loss of forest coverage within the urban boundary, adapting to extreme heat events quickly became an added benefit of the initiative. UHI considerations were also integrated into the development of Kingston’s Urban Forest Management Plan. “We felt like we needed an overarching plan that would address various tree-related issues, including the mitigation of urban heat islands,” said Damon Wells, Director of Public Works for the City of Kingston. THE APPROACH In 2009, it was estimated that Kingston’s urban forest occupied 21 percent of the urban area, which is comparable to many cities in Canada. When the city’s official plan was amended in 2010, an urban tree canopy target of 30 percent was included, which follows the recommended guidelines set by Environment Canada. Further policies were implemented simultaneously into the official plan to support this greening initiative. For instance, the official plan states that “community based initiatives such as community gardens and other forms of urban agriculture, and reforestation projects are permitted in all land use designations, subject to site by site evaluation.” In addition, the plan acknowledges the importance of preserving mature trees to the greatest extent possible when developing new lands. Prior to the publication of the 2012 Community Official Plan, the City of Kingston developed an Urban Forest Management Plan in 2011, which established guidelines and actions to ensure the long-term preservation of the cityâ&#x20AC;&#x2122;s urban forest through sustainable practices. The Urban Forest Management Plan provides a framework for monitoring progress toward established urban forest goals. The UHI effect tends to increase tree water requirements as the amount of water transpired by trees in urban settings almost always exceeds the quantity contributed by rainfall. Therefore, a Drought Protection Strategy was developed by the city to help the urban forest become more drought tolerant. During a drought, a Tree Watering Alert is activated to solicit the help of residents to ensure that public trees are watered and kept healthy. annually. While urban trees contribute to moderate the urban heat island effect, they also provide other significant co-benefits for the city. The urban forest can provide shade for buildings in the summer, filter and reduce the amount of stormwater runoff, provide bank stabilization along open watercourses, and create natural wind breaks. Following the implementation of the Urban Forest Master Plan, Kingston recognized the pending threat of the Emerald Ash Borer, an insect that kills ash trees, and developed a mitigation strategy to minimize the loss of trees. As part of this strategy, the city developed an urban tree inventory including the GPS location, size and condition rating of each municipal urban tree. This tool became key in addressing the Emerald Ash Borer impact but will also assist with further implementation of the Urban Forest Master Plan. Other initiatives were developed within the city to maximize the potential of the urban forest. For example, Royal Bank of Canada and the Kresge Foundation provided donations to support tree planting at hot locations along Kingston’s commuter bus routes. The shade can be particularly important to transit riders during hot summer days. A WORD FROM KINGSTON When asked what advice he would give to other municipalities interested in implementing a similar initiative, Damon Wells highlighted the importance of engaging the public in the development of greening initiatives. “By doing this, the members of the public became more supportive of the program and we were also able to gather great ideas from them,” said Mr. Wells. Another thing that contributed to the success of Kingston’s Urban Forest Management Plan was the creation of a tree advisory board in which various professionals and representatives from the local conservation authority and Parks Canada reviewed the various stages of the development of the plan. Council in 2009, is at the heart of the Incentive Program’s success. The Green Roof By-law requires that green roofs be installed on all new commercial, institutional, and residential development with a roof space larger than 2,000 square metres; requirements range from 20% to 60% of available roof spaces being covered with green roofs. Developers can opt to make a financial contribution to the city in lieu of meeting the above requirements. The payment in lieu from the Green Roof By-law is used to provide sustainable ongoing funding for the Eco-Roof Incentive Program. As part of the by-law, the city implemented a Green Roof Construction Standard in 2009 which sets out minimum design and engineering requirements that meet the city’s objectives and Ontario Building Code requirements. To be eligible for the Eco-Roof incentive Program grants, the design and maintenance of the roof must abide by the Green Roof Construction Standard. Furthermore, at the application stage, the city requires a five-year maintenance plan for both cool and green roofs to ensure their continued environmental performance. THE OUTCOME Since 2009, the Eco-Roof Incentive Program has supported 176 projects (44 green roofs and 132 cool roofs) with a total combined area of 375,000 square metres of roof space; an area equal to about 63 football fields. In addition, these eco-roof installations are estimated by the city to have diverted over nine million litres of storm water, reduced energy consumption by over 1,000 megawatt hours annually, and avoided over 120 tonnes of greenhouse gas emissions. A WORD FROM TORONTO When asked what advice she would give to other communities that would like to develop a similar incentive program, Annemarie Baynton, a Senior Environmental Planner at the City of Toronto mentioned the importance of engaging the roofing sector in the design and implementation of the Eco-Roof Incentive Program. When the program was launched in 2009, city staff provided program information and brochures to the roofing industry, helping them speak with their clients about the benefits of different eco-roofing options and the range of incentives available. “Recognizing the important role roofing professionals play in increasing program uptake, the program was designed with flexibility in the application process, allowing contractors to submit applications on behalf of their clients. This approach has led to an increased number of applications. In 2013, after further consultation with roofing professionals and property owners, the incentive program was expanded to include residential buildings.” One lesson learned from this expansion is that while there has been great interest from homeowners in the program, there has been a learning curve regarding the technical aspects of installing green roofs and reflective shingles on sloping roofs, showing the need for continued engagement with the residential roofing sector. higher heating demands in wintertime. However, these fears were proven unfounded because of several factors. First of all, there are fewer hours of sunlight in winter combined with a less direct angle in which sunrays hit buildings’ roofs, which results in a very small amount of warming potential for buildings. In addition, if heating was to be generated from solar energy through the roof, the hot air would remain at the top of a building’s structure and only provide minimal heat savings on rare occasions. A WORD FROM ROSEMONT-LA PETITE-PATRIE According to François Croteau, mayor of the borough of Rosemont-La Petite-Patrie, the implementation of the cool roof by-law has been successful due to several factors. For instance, “the borough itself was ideal for this type of initiative as it is densely built and mostly composed of flat roofs. The cool roof program was therefore more likely to be adopted on a higher number of properties and have a greater impact on the UHI effect in the area.” Mr. Croteau also believes that “the involvement of experts in the public consultation process contributed to both a higher acceptance and participation rate among homeowners of the borough.” Since the implementation of the program in Rosemont-La Petite-Patrie, four other boroughs in the City of Montreal have implemented a similar cool roof by-law. THE SCIENCE During an extreme heat event, effective communication between local agencies as well as with the public is essential. Rural and smaller urban communities are home to many heat-vulnerable individuals, including a rapidly growing older population and certain occupational groups (e.g. farmers, foresters, fishers, and other labourers doing outdoor work). Rural regions can also face unique challenges in developing and implementing heat-health preventative actions due to limited resources and expertise, proximity and access to health services, a smaller number of community support organizations and facilities, limited media for communicating in real time with local populations during an event and, finally, a greater likelihood of people being isolated or without public transportation compared with those living in urban settings. At the same time, rural communities have particular characteristics that can support the adoption of community-based strategies to minimize heat-health risks and enhance response efforts. Identifying and understanding the vulnerabilities that may threaten a specific community and the resources that can be leveraged during an emergency are key steps in building resiliency. Oxford County (population 106,000) is a primarily rural area located in Southwestern Ontario that consists of one city, two towns and five townships. Historically, Southwestern Ontario has experienced some of the highest recorded temperatures and humidex values in the country. Due to climate change, this region is expected to experience a doubling of days over 30Â°C by mid-century. THE TRIGGER An emergency heat event requires the participation of many parts of society during the alert, response and recovery phases. A comprehensive risk management approach to extreme heat necessitates effective partnerships among different levels of government, first responders, the private sector, volunteers, and community-based NGOs. In Ontario, a large number of communities have developed different thresholds for calling alerts, communication protocols and response mechanisms over time. By 2012, Oxford County Public Health and Emergency Services had committed to understanding and effectively managing the health risks and impacts from extreme heat. The County actively engaged neighbouring public health units and participated in multi-stakeholder workshops to collect information on key issues such as effective heat-health risk communication, interactions between medications and heat and methods for assessing community-level vulnerabilities. This information supported the development of a county-wide Heat Alert and Response System. THE APPROACH The County used an extreme heat tabletop exercise to identify the best way to coordinate a community response to an extreme heat event among the Countyâ&#x20AC;&#x2122;s departments, area municipalities, local organizations, and healthcare facilities. Recognizing the opportunity to engage a broad range of community partners about heat and health, Oxford County held the tabletop exercise in conjunction with the Countyâ&#x20AC;&#x2122;s annual emergency preparedness, response education, and training event. The all-day event began with a series of background presentations on the impacts of heat on vulnerable populations, regional climatology, interactions between heat and medications, and local services for a response. Participants then worked through a series of worsening heat scenarios within a controlled situational environment to test a planned heat alert activation and response before shifting to community recovery. Participants were asked to consider roles and responsibilities within their organization, existing procedures, as well as possible actions and decision-making. The scenarios developed emphasized exploration of community response capacity related to different possible situations, such as well-water contamination, power outages, community isolation and disposal of dead live stock. THE OUTCOME The exercise was a useful tool to raise awareness of this growing public health issue, identify gaps in existing risk management processes, and provide an opportunity to improve local response capabilities. Using the exercise as an education and training session was a highly successful approach to engaging partners and stakeholders. Close to 100 participants attended the tabletop exercise and it was one of the largest exercises of that nature facilitated by the County. The County was able to gain valuable insights about vulnerabilities in their community and the measures needed to address them. Four key themes emerged from the exercise: •	Communication between affected agencies, the general public and the emergency operations centre is essential. The exercise provided the first opportunity for these units to come together to discuss response communication (e.g. who is responsible for issuing a heat alert, who declares an emergency and informs the public in a timely manner?). •	Many agencies that participated in the exercise identified the importance of reviewing their current policies (if they exist) on extreme heat. •	Informing the public is a delicate balance between being proactive and desensitizing the population, especially those most vulnerable to heat. •	There are resource challenges for rural emergency management operations. Resource demands were frequently mentioned by participants throughout the exercise. Examining the coordination of efforts to respond to extreme heat in a participatory fashion permitted Oxford County to work towards developing a robust Heat Alert and Response System for the region. A WORD FROM OXFORD COUNTY When asked what advice he would provide to a rural community looking to develop a Heat Alert and Response System, Peter Heywood, Manager, Health Protection for Oxford County Public Health and Emergency Services suggested that “during a heat emergency, the response to vulnerable populations in rural communities, including older adults, requires special consideration and care.” In Oxford County, the 55+ population is proportionally larger and increasing at a slightly faster rate than the Ontario average. Looking forward, this has implications for Oxford County with respect to the accessibility of this population to services, including public transportation and cooling centres. It also impacts how heat-related information is disseminated to people residing in rural areas. Mr. Heywood recommended that “local public health units partner with area municipalities and community agencies to conduct a vulnerability assessment.” The assessment can support and guide heat-related response activities in rural settings. Oxford County is in the initial stages of an assessment and is hopeful that it will allow municipalities and community agencies to improve their preparedness, response and recovery activities related to extreme heat events, with a particular emphasis on older adults. THE SCIENCE The way that extremely hot days affects the health of individuals varies depending on many elements. Factors such as age, type of housing, underlying health condition and ability to access cooling facilities will influence how a person is affected by particularly hot days. During a heat wave, temperatures can stay high both during the day and at night for days in a row, making it difficult for the human body to cool down. For certain individuals, prolonged periods of hot temperatures represent a significant threat as they can result in severe health problems or, in some cases, even death. Various groups of the population have been identified as being more prone to be affected by extreme heat, such as seniors, children, people with low incomes, homeless populations and individuals suffering from pre-existing health conditions. When developing a Heat Alert and Response System, it is crucial for municipalities to consider these groups as they are the most likely to be affected by heat waves. THE TRIGGER In the early 2000s, the City of Greater Sudbury and its Health Unit determined that no plan was in place to respond to extreme heat events to protect the population from heat-health risk. At the same time, the province noticed an increase in heatrelated illnesses in Ontario. The creation of the Hot Weather Response Plan therefore emerged from a desire for the city and its Health Unit to be in a better position to prepare for an extreme heat event. While the plan is intended to protect the entirety of the population from the health risks associated with extreme heat events, it also has a particularly strong focus on assisting the most vulnerable groups of the population. Furthermore, the city differentiates itself by offering free public transit to cooling centres to the entire population on days when heat alerts are called. THE APPROACH Key objectives of the Hot Weather Response Plan are to ensure that all agencies working with vulnerable groups can provide the necessary information on what precautions to take during extremely hot days, and that access to cooling centres is facilitated for high-risk populations. During an extreme heat event, the Sudbury and District Health Unit has the responsibility to notify the City of Greater Sudbury’s Emergency Management Department when a heat alert is declared. From there, the City’s Emergency Manager informs community heat response partners of the alert status through a pre-established communication network. It is then the city’s responsibility to inform the public about heat-health risks as well as the location of cooling shelters. This is done through the use of various social media platforms, public service announcements and the city’s website. The Health Unit also responds to health-related media requests and posts important updates on its website. During an alert, the city requests that local utilities halt all service cancellations until after the heat alert has passed, extending hours of operation and supervision at municipal beaches, expanding locations and hours of operation of public swims at city pools, and opening cooling centres at public libraries, citizen service centres, and community centres. In addition to opening cooling stations and informing the city’s residents of their locations through various media, the City of Greater Sudbury took another important step by ensuring that access to cooling facilities be possible for all. To accomplish this, the city partnered with Greater Sudbury Transit to make all transit routes free during extreme heat alerts. In addition, they are planning in the future for para-transit to be made accessible at no cost for residents who would need it. THE OUTCOME While the City of Greater Sudbury has issued heat warnings on many occasions, it has never had to activate the Hot Weather Response Plan since its inauguration in 2007. However the Sudbury Health Unit still reviews annually its educational materials outlining general precautions to take during hot weather. The bilingual documents produced by the Health Unit are distributed widely among the city’s residents and to specific community organizations such as clinics, day cares, long-term care facilities, seniors’ residences, food banks, religious institutions, school boards, and indigenous groups. THE SCIENCE Canadians living in both urban and rural areas of the country are at risk of being affected by extreme heat events. While urban areas may be warmer than their rural surroundings on extremely hot days because of the urban heat island effect, high temperatures still pose a significant health risk to those living in smaller communities. Implementing a Heat Alert and Response System comes with different challenges in rural regions. For instance, issuing timely alerts can be challenging in a place where the local newspaper is only printed weekly. Similarly, identifying vulnerable populations can represent a demanding task in rural communities as less data is available to monitor the relationship between temperature, mortality, and morbidity. Cooling options during extreme heat events also differ between urban and rural settings. While larger cities are more likely to have more and larger public buildings for use as cooling facilities, smaller communities may tend to rely instead on the support of social networks to communicate about and identify and access cooling alternatives. In general, the implementation of successful Heat Alert and Response Systems in small rural communities benefits from strong social capital and the reliance upon solid social networks. These important relationships among community members can contribute to increased preparedness and response capacity, thereby helping to ensure everyone is cared for within a community. THE TRIGGER In 2011, Health Canada published a Best Practices Guidebook on Heat Alert and Response Systems, which included a chart presenting heat projections for specific Canadian cities, including Winnipeg (see Figure 19). The publication became a catalyst for the Government of Manitoba, which had not yet ranked extreme heat as a significant health risk. Subsequently, a dialogue began between Manitoba, Health Canada and other Canadian communities on how to develop local Heat Alert and Response Systems. In consultation with various stakeholders, Manitoba Health, Seniors and Active Living (MHSAL) decided to develop a plan that was province-wide, incorporating both urban areas and more rural/remote parts of the province. Shortly thereafter, two regional health authorities partnered with the MSHALâ&#x20AC;&#x2122;s Office of Disaster Management to conduct vulnerability assessments for both the urban centre of Winnipeg and the smaller rural community of Melita (and immediate surroundings), which lies within the southwestern corner of the province. Both Winnipeg and Melita consequently became the sites of two Heat Alert and Response System case studies in the province of Manitoba using the findings of the respective vulnerability assessments. supported the completion of a heat vulnerability assessment for Melita and surrounding areas, and provided guidance in the design of a rural Heat Alert and Response System for the community. The vulnerability assessment was conducted in parallel with a table-top exercise, which simulated an extreme heat event. These two activities revealed the risks related to extreme heat faced by the small rural community, the characteristics of vulnerable groups, and existing capacities and limitations within the community. The Assiniboine Regional Health Authority and the Town of Melita used this information to begin development and implementation of a local Heat Alert and Response System for the community. Following the assessment, the committee asked local Emergency Medical Services to include a heat vulnerability assessment of all older adults as part of a general health assessment, including, for example, whether or not they had a means by which to cool their homes. Information about reducing health risks from extreme heat events has also been made available through various sources such as the local newspaper, heat-health fact sheets, brochures, and through informal resources such as childrenâ&#x20AC;&#x2122;s colouring sheets. Information on heat-health risk was distributed to medical clinics, published on both the MHSAL and Regional Health Authority websites, and communicated through a provincial information line dedicated to providing a wide range of health advice. The information was also provided to the community through public health staff, home care programs and Emergency Medical Services. The acute care staff at the Melita Health Centre and other Assiniboine RHA sites also used Health Canada heat tools in their assessments for out-patients in the emergency rooms. As part of the development of the Heat Alert and Response System, the potential locations for cooling options within the Melita area were identified. One of the highlighted limitations facing this small community was that potential cooling facilities are not large enough to welcome large numbers of people during an extreme heat event. Therefore, multiple cooling alternatives had to be identified including the outdoor swimming pool, bowling alley, seniors centre, and the library. A discussion was held in relation to local resources that could be used to transport high-risk individuals to cooling stations; the local Handi-Van service was one such resource. In summary, the case study highlighted the ability of the community to draw upon strong social networks in provision of support to those needing transportation or other assistance during extreme heat. THE OUTCOME The Regional Health Authority was able to leverage Melita’s strong social capital and social networks to undertake a vulnerability assessment and identify strengths and challenges in the implementation of a local Heat Alert and Response System. Through this process, volunteers were identified as valuable assets for assisting with aspects of the system such as transportation to cooling facilities or water distribution during extremely hot days. The engagement of various stakeholders in Heat Alert and Response System activities helped reinforce communication and relationships between the residents and those providing social support services, and enabled the system to be adapted to local conditions. For instance, the participation of Emergency Medical Services allowed for a greater understanding of heat-health risks within the community and served to simultaneously educate the population about these same risks. One of the other take-away lessons learned during this study was the importance of including air-conditioned or cooling areas in long-term care facilities. Following the completion of the assessment, there was a push to provide air-conditioned areas in all long-term care facilities located within the boundaries of the Assiniboine Regional Health Authority. The first site to receive upgrades was the Melita Personal Care Home. Three other capital projects were completed within the next year across the region. THE SCIENCE The Regional Municipality of Peel (population 1.4 million) is located on the shore of Lake Ontario just west of the City of Toronto. Peel Region, which consists of three local municipalities – the City of Mississauga, the City of Brampton, and the Town of Caledon – is one of the fastest-growing municipalities in Canada. The urban tree canopy provides a plethora of social, environmental, and ecological benefits to communities in Peel Region. Trees help reduce the urban heat island effect, reduce peak storm water run-off volumes, increase property values, mitigate air pollution, and improve mental health. Despite these benefits, municipalities in Peel Region have limited budgets with which to maintain existing tree cover and plant new trees. In addition, various pests and diseases such as the Emerald Ash Borer and an increase in extreme weather events because of climate change have dramatically accelerated the natural rate of tree loss and increased pressure on the urban tree canopy locally. The increased threats to the urban forest as well as rapid population growth raises some important questions for municipal planners and foresters. How can tree planting be encouraged beyond traditional areas like valley lands? Are there tools available to help practitioners direct limited resources to most effectively manage the urban tree canopy? THE TRIGGER Tree planting and maintenance services in Peel Region are primarily provided by the cities of Mississauga and Brampton, and the Town of Caledon. Between 2007 and 2011, the Region of Peel collaborated with these local area municipalities and two local conservation authorities (Toronto and Region Conservation and Credit Valley Conservation) to develop a comprehensive Peel Region Urban Forest Strategy. Following the publication of the Strategy in 2011, city and regional officials began discussing how to implement it. Questions arose about how best to direct limited resources to maximize the multiple environmental, social, and economic benefits of trees to the community. Discussion centred on the need for a rigorous science-based mapping tool that could help environmental stewards, planners and urban foresters prioritize geographic areas for tree planting based on scientific evidence of their multiple benefits. Step I: Identification of sustainability themes The consultants conducted a comprehensive review of the scientific literature on the multiple benefits of the urban forest. The project team in consultation with stakeholders then grouped the various benefits into eight overall categories under three sustainability themes. Step II: Identification of criteria to apply to the sustainability themes The project team began this step by identifying potential target benefits and reviewing data sets at various scales to spatially define each of the eight categories of benefits. In consultation with stakeholders, the categories were screened with the data sets and cross-checked with scientific literature to arrive at 12 target benefits, along with data sources, spatial extent, and effective weighting. See the example above for â&#x20AC;&#x153;mitigating urban heat island effects.â&#x20AC;? Step III: Development of the GIS-based planting priority tool The consultant used the datasets identified in steps 1 and 2 to develop an integrated computer-based mapping tool. Targeted benefit areas were combined with land cover mapping of possible planting areas (i.e. areas where there is existing open space such as bare earth and grass in which to plant trees) to derive a normalized score to prioritize geographic units for planting. THE OUTCOME The final tool is a flexible GIS model that can generate maps that illustrate areas to prioritize tree planting at different geographic scales; the smallest being census dissemination areas. The model and outputs are available to project partners to view and combine as necessary to meet specific program needs. Local municipalities and conservation authorities plan to use the tool to guide their efforts in managing and growing the urban forest. Credit Valley Conservation, for example, intends to use the tool to guide outreach and restoration efforts on public and private lands in parts of the watershed that are being developed. The Town of Caledon plans to use the tool to identify gaps in the tree canopy on municipal lands where planting space is already available and planting activities could be launched in the short term. The tool could also be used in future review of development applications. The maps could be helpful for identifying existing woodlots and justifying management plans and proposed extensions to them. A WORD FROM PEEL REGION When asked what kind of advice she would give to other communities that would like to develop a similar tool, Janet Wong, a Planner at the Region of Peel mentioned that â&#x20AC;&#x153;developing a priority planting tool and establishing the overall benefits that trees could provide to the community is an intensive process that requires extensive consultation with people from across various organizations that have a diverse set of experiences and interests. In addition, suitable spatial data sources to reasonably and scientifically reflect target benefits to establish priorities for a large region need to be available to develop and help refine the tool.â&#x20AC;? THE SCIENCE Extreme heat events are a growing threat to the health of Canadians as the climate continues to change. Windsor is the southernmost city in Canada and experiences some of the warmest summertime temperatures in the country. During summer months, temperatures are often above 30oC and average humidex values are the highest in Canada. Climate change is expected to significantly increase the number of extreme heat days annually in the region. This may exacerbate the risk of heat-related illness and deaths, particularly among seniors, people with chronic illnesses and other vulnerable groups. Extreme heat can cause serious illness and even death if people do not take protective measures in hot conditions. It can lead to skin rashes, cramps, dehydration, syncope (fainting), exhaustion and heat stroke. In Windsor, there is a strong association between excess mortality and temperature; at approximately 29Â°C, excess mortality begins to increase as ambient temperatures increase. THE TRIGGER The City of Windsor and the Windsor-Essex County Health Unit led development of a Heat Alert and Response System to protect people in Windsor, particularly the most vulnerable, from extreme heat events. Development of effective community alert and response measures depends upon assessment of population and community vulnerability. Heat-health vulnerability assessments document baseline exposures and take into account population sensitivities as well as how individuals, communities, and society respond to extreme heat events and their capacity to adapt in the future. They provide decision makers and the public with knowledge about existing vulnerabilities to these events and to future climate change conditions, along with the range of responses needed to reduce adverse health impacts. THE APPROACH The City of Windsor and Health Canada collaborated to undertake a heat-health vulnerability assessment to strengthen the Heat Alert and Response System as well as to engage important stakeholders. The methodology for the assessment was drawn from a framework developed by the Pan-American Health Organization and the World Health Organization for assessing health vulnerabilities related to climate change. The vulnerability assessment proceeded in five steps: (1) an initial assessment of the scope, objectives, work plan and stakeholders involved; (2) the collection and analysis of data, including an examination of the relationship between temperature and mortality; (3) the projection of future climate for the Windsor region; (4) a literature review to provide background information about the impacts of heat on health, vulnerability assessment methods and best adaptation practices; and (5) workshops to consult with stakeholders and the community about existing vulnerabilities, adaptive capacity and potential adaptation actions. The vulnerability assessment provided information that allowed city officials to develop more effective adaptation interventions. THE OUTCOME The final report, Assessment of Vulnerability to the Health Impacts of Extreme Heat in the City of Windsor (2011), found that people living in Windsor are vulnerable to the health impacts of extreme heat events and actions are needed to prepare for increasing risks to health. Examples of key heat-health vulnerability factors included the following: •	Urban heat islands have been documented along the Toronto–Windsor corridor and in the Detroit–Windsor region. Continued urbanization of this region will result in an amplification of community exposure to extreme heat events. •	Relative to Canadian and Ontario populations, people living in Windsor suffer more from a range of chronic diseases (high blood pressure, asthma, diabetes, obesity, circulatory disease, cancer) that increase vulnerability to the health impacts of extreme heat events. •	Community events in Windsor during the summer season, which often attract large numbers of tourists from across the United States border, mean the potential exposure of very large numbers of people to extreme heat events. •	Of the 4,728 community housing units that the city and county manage, the vast majority of these do not have air conditioning, increasing the vulnerability of residents to heat-related illnesses and deaths. A lack of other cooling facilities, such as water fountains in public spaces, may also increase health risks during extreme heat events. •	Current awareness and knowledge of risks to health from extreme heat events and about protective measures among public and social service agencies is low and needs to be increased. Based on the assessment findings, the City of Windsor is taking a number of actions to increase the resiliency of populations to extreme heat events, including development of a broad communication strategy with an extended reach through a social media campaign, completion of urban heat island mapping to assess urban heat island reduction measures, and improvement of the thermal design of city parks (including consideration of both natural and artificial shade, water features, and consideration of cool surfaces). THE SCIENCE Adequate urban forests in cities can bring significant benefits to communities, such as the removal of atmospheric pollutants, noise reduction, microclimate regulation and mitigation of urban heat island conditions. In rapidly growing cities, the incorporation of an adequate tree cover can be challenging, as new developments are designed quickly to respond to a significant population increase. As such, the inclusion of trees into new developments is often considered as an afterthought once new roads and buildings are already built. In addition, as cities grow, the monitoring and maintenance of older trees that provide a great amount of shade also needs to remain a priority for municipal leaders in order to control the urban heat island effect. The planning of an expansive and healthy urban forest requires the participation of several entities within local governments, such as the Parks, Engineering, and Planning Departments. The inclusion of other key players such as local residents and educational institutions is also important to implement successful greening initiatives that will resonate with community members. THE TRIGGER Surrey is a rapidly growing city with approximately 12,000 new residents moving within its borders every year. This rapid increase in population has been happening for many years now and is one of the main reasons the City of Surrey started looking closely at urban tree-related issues in the late 1970s. When development happens at such a fast pace, the urban forest cover also decreases quickly as trees are cleared to prepare the land for new construction. Approximately 5,000 trees are planted in Surrey on public property every year and while most of them are planted in new neighbourhoods, the city aims to plant 1,000 trees in older areas annually. Surrey is also able to save 3,000 mature trees per year on private property due to its private property tree protection by-law, which aims to reduce the number of trees that are unnecessarily removed, killed or damaged. The by-law also requires the replanting or replacement of trees that have been felled. Without this by-law those trees would not be replaced. THE APPROACH Over the last 40 years, Surrey has developed a robust street tree management plan that encompasses several programs and promotes participation by residents. As part of its greening strategies, the city created a private property tree by-law in 2006 to protect the entire tree cover located on private property across the city. When property owners wish to remove trees on their properties, they need to apply for a permit and ensure that the tree to be removed will be replanted or replaced elsewhere. In addition, Surrey recently developed the Shade Tree Management Plan 2016-2036, which guides the planning, design, development, and maintenance of Surreyâ&#x20AC;&#x2122;s public property shade trees. The combination of these two programs means that every tree over 30 cm in diameter and above 1.4 meters in height located on private property in the city is listed in an inventory and protected by the city. In Surrey, residents are also encouraged to plant more trees through the city’s tree voucher program where they can purchase a voucher for $25 and use it to buy a tree of a value up to $75. The city also assists residents who purchase vouchers by helping them pick the right type of tree species for their property and providing recommendations on where to plant the tree on their lot to maximize shading potential. The city has initiated two volunteer community organizations to promote citizens’ involvement in the protection of Surrey’s trees. The first organization composed of Surrey’s residents is called the Tree Team and focuses on canvassing neighbourhoods to educate residents on the importance of street trees, hosting tree-themed information booths at various events in Surrey, and encouraging residents to plant backyard trees. The second organization called the Surrey Youth Stewardship Squad engages youth in spreading information on the many benefits of trees. The group’s initiatives also include planting native trees, cleaning up Surrey’s parks and shorelines, and removing invasive plants. Both organizations have been in place for over a decade. THE OUTCOME Making trees a priority in Surrey allowed the city to plan for a future under climate change where a growing population is expected to face more extremely hot days. The priority on protecting trees in Surrey means that hard infrastructure sometimes needs to be planned differently to protect and maintain the tree cover. In certain cases, this means planning wider boulevards to include medium- and large-sized trees and in others, it means moving a sidewalk to protect an existing tree that has been there for many years. On private property, new house plans are redesigned to minimize the removal of trees. Surrey recently began exploring the idea of developing guidelines to increase planting in the downtown core, as this more urbanized section of the city is more prone to the urban heat island effect. City staff is also looking at making changes to soil requirements under concrete in order to install structured soil that would provide adequate conditions for trees to grow in highly urbanized areas. A WORD FROM SURREY When asked what advice he would like to give to other municipalities who would like to implement tree-related initiatives in their community, Neal Aven, Urban Forestry and Environmental Program Manager for Surrey’s Parks division, emphasized the need to get input from the community on greening initiatives. “In order for people to have a sense of ownership about a resource like trees, it is important to involve residents in an advisory role. Supportive elected officials are also crucial because they have their pulse on what the people in the city are interested in and can translate these interests into policy development,” said Mr. Aven. Steve Whitton, Tree and Landscape Manager for the City of Surrey, added that “it is important to have a well-staffed team on these programs as well as a strong private property by-law to overview development permits and make sure the approved developments won’t damage the tree cover. This allows city staff to look after and manage every single tree of a certain size in the city.” Mr. Whitton also emphasized the importance of a strict enforcement of tree by-laws in order to maintain high tree cover targets. THE SCIENCE The construction industry has evolved significantly over the last few decades as new technologies and new design approaches have emerged to reduce both the energy consumption of buildings and their reliance on heating and cooling systems. Several of these innovations have been developed to ensure thermal comfort within the building envelope while relying on very little energy needs. For instance, passive cooling technologies have been developed and implemented in many buildings, allowing for better control of heat gain and heat dissipation to improve indoor thermal comfort with low- to no-energy consumption. THE TRIGGER As the City of North Vancouver was grappling with the problem of reducing greenhouse gas (GHG) emissions and energy use, it examined its main sources of emissions and prioritized interventions accordingly. Unlike most urban areas, the City of North Vancouver does not attribute most of its emissions to transportation. Indeed, the city has approximately equal levels of emissions produced by the building and transportation sectors because of transit-oriented planning efforts made in the early development of the city. As such, planners in the City of North Vancouver decided to place a focus on the building sector to achieve the cityâ&#x20AC;&#x2122;s emissions and energy use reduction goals. use or costs, while virtually all new construction will be built to achieve higher energy performance than what is required by the provincial building code. THE OUTCOME Through its strong push toward passive and highly energy-efficient buildings, the City of North Vancouver is aiming to significantly reduce the energy consumption of buildings in the city. “A lot of our efforts have been around refocusing the behaviour of buildings. We highly incentivize Passive House construction and are getting all of the builders exposed to this way of designing and building new construction in order to increase climate resiliency in our city”, said Emilie Adin, Deputy Director of Community Development for the City of North Vancouver. The construction of certified Passive Houses aligns with climate resiliency goals, as these properties can be self-sufficient under a wide variety of temperatures. A WORD FROM THE CITY OF NORTH VANCOUVER When asked what advice she would give to municipalities that would like to follow the lead of the City of North Vancouver in their energy efficiency initiatives, Ms. Adin recommended to always look for win-win situations and examine what can be leveraged within your organizational structure. “One of the things we did for the zoning by-law was to look for outdated provisions used to promote density, and swapped these out with energy efficiency provisions. For instance, we traded out an old requirement tying greater density to exponentially higher parking, in order to get industry buy-in for new energy requirements and to remove provisions that were at odds with the city’s other climate action goals,” said Ms. Adin. This specific situation represented a “win-win” as it helped the city achieve its climate action goals and removed the parking requirements that developers were made to provide for higher density buildings. According to Ms. Adin, it is extremely important to avoid overregulation by looking at what requirements can be removed even as you are adding more. Finally, she mentioned the importance of getting the right people involved from the beginning and keeping everyone on side by understanding each stakeholder’s interests and priorities. Local and regional health authorities across Canada are taking actions to reduce the risks of adverse health impacts from extreme heat events. Leading communities have developed and implemented comprehensive plans, which generally include two broad strategies to confront the health risks from extreme heat. First, it is critical to enhance local preparedness for future heat waves. Many communities have implemented Heat Alert and Response Systems, systems that alert the public when there are dangerously hot days and put in place a strategy to inform and protect the community from health risks associated with extreme heat. These systems may include a plan to make cooling centres available, to distribute water to those in need, and to inform the most vulnerable when an extreme event strikes. Second, communities are making investments in preventative measures to reduce the risk of extreme heat events resulting in health issues. Preventative actions may include an expansion of the tree cover, promoting green and cool roofs, and efforts to increase social networks among vulnerable populations. The implementation of these actions can have long-term benefits within a community. For instance, the expansion of tree cover can mitigate the effects of urban heat islands and the implementation of cool roofs can help reduce heat absorption by buildings and enhances thermal comfort for their occupants. A comprehensive local plan to adapt to extreme heat events combines a strong Heat Alert and Response system with preventative actions. ASSESSING LOCAL RISKS The foundation for a comprehensive Heat Alert and Response System begins with an assessment of heat-health risks in the community. This includes a review of historic weather information from Environment and Climate Change Canada. It also consists of a review of how often the local temperature has been above the community threshold at which adverse health outcomes begin to occur. Communities need to look at how often they have experienced several consecutive days of hot weather. In addition, it is important to remember that extreme humidity increases the risk of adverse health impacts. As such, Canadian municipalities need to evaluate what is the likelihood of high humidity coinciding with extreme heat, and whether or not there are any trends in the frequency of high-humidity days. Other factors can also be assessed such as air quality and the risk of power failure. Environment and Climate Change Canada, Health Canada, and university-based climate experts, like the Institute for Catastrophic Loss Reduction, can assist with the assessment of historic weather data and other factors leading to vulnerability to extreme heat. For example, it is important to also assess climate projections of future risk of extreme heat events. The climate is changing; temperatures are warming and the frequency and severity of extreme heat events is expected to increase across the country. Detailed climate projections of future extreme heat events can be used at the local level to inform better alerts. Environment and Climate Change Canada and a number of provincial, regional and academic organizations (including Ouranos, Pacific Institute for Climate Solutions, Prairie Adaptation and Research Collaborative, and Ontario Ministry of the Environment and Climate Change) offer local climate projections. An important, but sometimes difficult dimension of assessing local risks is the challenge of obtaining historical information about the consequences of extreme heat on people’s health. Important questions for local health practitioners include: Can local hospitals share information about the impact of extreme heat on admissions with cities and local health authorities to help them better prepare for and respond to extreme heat events? Is there evidence specific to the community that shows the relationship between temperature and the risk of fatality? Is there any local information about the impact of air pollution and extreme heat on health? Efforts to date stress the value of undertaking a high-quality vulnerability assessment to better understand local health risks from extreme heat. The information collected in vulnerability assessments provides the foundation for action to establish and maintain an effective Heat Alert and Response System. A detailed local vulnerability assessment is also critical to support investments in prevention as it will allow for the identification of priority actions. Importantly, communities that have completed heat-health assessments found that extreme heat events result in an increased risk of illness and death, and much of this increase is preventable. It is therefore crucial to ensure that extreme events are identified, warnings are issued, and appropriate response takes place throughout the community. EXTREME HEAT ALERT AND RESPONSE SYSTEMS Alert and warning programs can be managed by provincial, regional or local governments, with specific aspects of the system managed by different agencies. Officials need to ensure that there is no duplication or lack of uniformity in the warnings that are provided. Heat Alert and Response Systems need to be evidence-based, using clearly defined processes and measures of success. Engagement of key stakeholders, like partners in the media and response professionals, is critical to an effective program. It is important, for example, to build local awareness about the distinction between a ‘heat alert’ and a ‘heat warning’. Determination of an alert trigger will benefit from stakeholder engagement. During an extreme heat event, it is particularly challenging to ensure that everyone within a community receives the appropriate information that will ensure their health and the health of their families is protected from particularly high temperatures. Local and regional leadership is essential for preparedness efforts. Health Canada has identified five critical elements in an effective alert and response system: 1. Community mobilization and engagement Efforts to reduce the risk of adverse health impacts from extreme heat are most effective when local and regional health officials engage social service providers, voluntary agencies, and other stakeholders in the development and implementation of a response plan. This may include emergency response organizations, home care providers, homeless services, tourism centres, faith-based groups, and a number of municipal agencies. Community engagement can assist in the assessment of local vulnerability to the health impacts of extreme heat. Engaging various stakeholders such as local health authorities, community groups, and city officials is useful to assess awareness of health issues among individuals in the community. It is also useful to determine which existing networks in the community could be used for sharing heat alerts and information about protective actions that should be taken when an extreme heat event strikes. It is important that the engagement effort be as detailed as possible to determine the specific heat-health risks faced by individuals living at a specific location in the municipality. 2. Alert protocol Public health authorities need to establish an alert protocol to identify weather conditions that could result in increased adverse health conditions for the community. There are differences in the details of the protocols and alert triggers presently in place across Canada, with no single approach emerging as superior in all respects. Protocols are based upon the risk of unusually high temperatures during the day, sustained high temperatures through the evenings, the risk that these conditions will continue for several days without easing, and complication associated with high humidity. There is value in distinguishing between heat events that are expected to exceed the identified thresholds, and very severe heat events that may significantly exceed the ability of individuals to cope. The alert protocol identifies different levels of threat and makes this information available to the community at risk. Evidence-based information for when to call an alert provides an important foundation for building public awareness about heat-health risks in the community, and public confidence about the value of the warnings. 3. Community response plan An effective response plan relies on the outreach capacity of participating government agencies and non-governmental organizations. It needs to be tailored to the specific needs of the community and its vulnerable populations. The response plan needs to take into account heat-vulnerable groups and the specific challenges each group faces. For example, the best mechanisms to alert and assist older adults may differ from those used to reach tourists, recreational athletes, the homeless, people who work outdoors, infants, those with chronic illness, and those with low incomes. Most response plans include the provision of cooling centres, access to drinking water, and information about how to take protective actions. Local cooling facilities may include libraries, community centres, city halls, swimming pools, and spray pads. These facilities can be supplemented by arrangements with places of worship, shopping malls, senior centres, and movie theatres. 4. Communications plan Experience in Canada and elsewhere around the world consistently identifies communications as a difficult element in Heat Alert and Response Systems. Some people remain unaware of the threat despite aggressive alert and warning communication and many people fail to act on the advice provided. Many programs seek to engage the community before the heat season, during the heat season, and during an extreme event with different messages. Before the heat season, there is scope to build awareness about individual and family preparedness, community options for risk reduction, the signs of heat illness, and details about where to get more information. The communication plan should strive to establish a network of stakeholders able to bring forward consistent information about the nature of the threat and the best options to prepare. In the summer, there is often greater public interest in heat-health issues. During these months there is scope to work with partners to raise awareness about the potential adverse impacts of extreme heat and focus on identifying actions that should be taken when an event occurs. The opportunity also exists to focus on prevention by advising people to ensure that their air conditioners are working properly, raising awareness about the importance of staying cool and well hydrated, and promoting the planting of shade trees to provide shade and cooling. During an event, the communication goal is to get people to take protective measures. The communication plan could include a press release to have the media issue the appropriate alert or warning, as well as the sharing of information with established partners to implement the agreed strategy to engage the community. 5. Evaluation plan A formal evaluation of performance is an important tool to refine and improve Heat Alert and Response Systems. Evaluation is a common process for public health and many other policy areas, but it is an emerging tool for Heat Alert and Response Systems. Two types of evaluation can be undertaken â&#x20AC;&#x201C; process and outcome. A process evaluation is used to determine if each component of the Heat Alert and Response System operated effectively during an event. An outcome evaluation focuses on assessing the impact of the program toward achieving its goals and objectives. Both processes can provide specific advice to health authorities concerning scope for improvement. An evaluation that emphasizes collaboration and stakeholder feedback can enhance partnerships that strengthen capacity and the effectiveness of future responses. The evaluation process can be applied following a major event and can also employ use of a tabletop exercise to discuss a simulated emergency situation. A tabletop exercise, with a focus on process, can be part of the creation of a new Heat Alert and Response System, or evaluation of an existing program. PREVENTATIVE ACTIONS â&#x20AC;&#x201C; REDUCING URBAN HEAT Long-term investments to keep communities and their residents cool can enhance the resilience of a community and prevent heat-health threats. A longer-term plan to invest in prevention complements a Heat Alert and Response System where the focus is on near-term preparedness. Health Canada has identified seven preventative strategies for reducing the risk of adverse heat-health impacts in a community: 1. Reducing urban heat island effects The air temperature in urban centres may average 1Â°C to 3Â°C higher than surrounding areas. Urban environments tend to be built with non-reflective and impermeable materials that are better at absorbing heat during the day and slower to release the heat at night than are surrounding areas. The differences are greatest when there is a decrease in natural land cover, particularly mature trees, which provide shade and cool the air through evapotranspiration. Some measures that reduce urban heat islands include the use of green infrastructure, cool roofing, and urban forests. Additional options include the use of permeable materials for parking and roads, bio-swales for storm-water management, as well as green roofs, tree planting programs, and landscaping guidelines. 2. Promoting healthy communities and individuals Recreation master plans can promote local actions that increase tree shading in parks, increase the area available for recreation, and generally enhance the health of the community. Active and healthy people are generally more resilient to extreme heat, so general public health promotion efforts also reduce the risk of adverse heat-health issues. 3. Modifying transportation policies The provision of trails for walking, biking, and jogging can also reduce the risk of heat illness and death if people take protective measures during heat events. Coupled with appropriate lighting and repairs to older infrastructure, these actions can encourage healthy transportation alternatives for citizens throughout the community. During extreme heat events, it is also extremely valuable to provide transportation to cooling centres. 4. Improving social capital and social networks Effective Heat Alert and Response Systems work with existing social networks to communicate heat-health risk information and organize response during extreme heat events. Cultivating strong social networks within a community can result in a greater awareness of heat-health risks among residents as well as a greater response capacity during extreme heat events. Strong social networks are particularly important in smaller and rural communities where municipal resources might be more limited. 5. Building climate resiliency Efforts to address extreme heat are best situated within an overall local climate resiliency strategy. Extreme weather and climate change is expected to threaten local infrastructure through increased urban flooding, coastal flooding from sea level rise, and more local storms and wildfires. Extreme heat is one of many climate threats that can be effectively managed by local governments. 6. Assessing heat-health vulnerability The initial establishment of a Heat Alert and Response System should include an assessment of vulnerability of individuals and of the broader community to extreme heat events. A long-term prevention strategy can be informed by an assessment of expected trends in vulnerability associated with an aging population, disease prevalence, urbanization, and change in the climate. 7. Reducing greenhouse gas emissions Local governments can replace older vehicles with fuel-efficient models, improve the energy efficiency of public buildings, and encourage action by citizens to reduce the use of greenhouse gases. Reduced emissions can slow the pace of global warming and the rate of increase in extreme heat events. Some measures to reduce greenhouse gases can also help people stay cooler during extreme heat events (e.g. insulating homes). 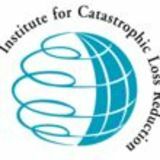 ABOUT ICLR The Institute for Catastrophic Loss Reduction (ICLR), established in 1997, is a world-class centre for multi-disciplinary disaster prevention research and communications. ICLR is an independent, not-for-profit research institute founded by the insurance industry and affiliated with Western University. ICLR staff and research associates are recognized internationally for their expertise in wind and seismic engineering, atmospheric science, risk perception, hydrology, economics, geography, health sciences, and public policy, among other disciplines. The International Council for Science established ICLR as an International Centre of Excellence in Integrated Research on Disaster Risk. ICLR’s mission is to reduce the loss of life and property damage caused by severe weather and earthquakes through the identification and support of sustained actions that improve society’s capacity to adapt to, anticipate, mitigate, withstand and recover from natural disasters. ICLR is achieving its mission through the development and implementation of the following programs: Open for Business, to increase the disaster resilience of small business; Designed for Safer Living and Insurers Rebuild Stronger Homes, which increase the resilience of homes; and RSVP cities, to increase the resilience of communities. ABOUT HEALTH CANADA Health Canada is the Federal department responsible for helping Canadians maintain and improve their health. Health Canada’s goal is for Canada to be among the countries with the healthiest people in the world. The Climate Change and Innovation Bureau at Health Canada has the mandate of increasing knowledge of climate change impacts on health and supporting the development of measures to adapt to protect the health of Canadians. Since 2008, Health Canada has been supporting communities across Canada develop resiliency to extreme heat events.